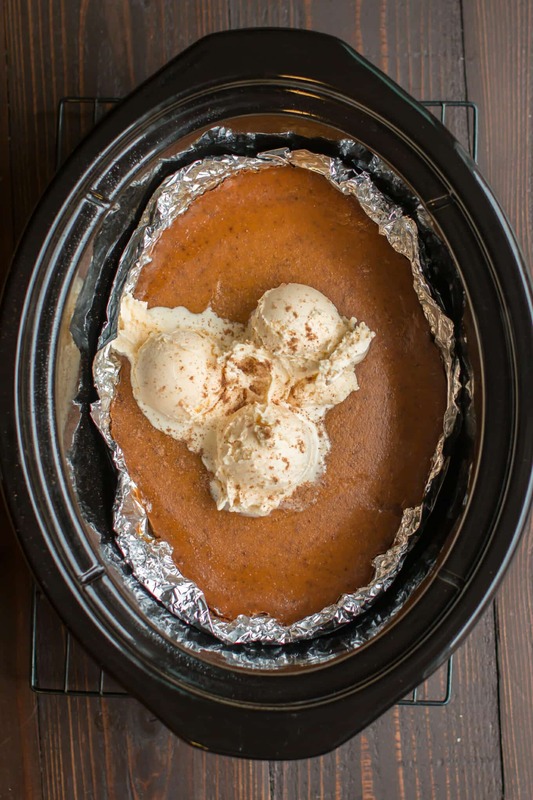 Slow Cooker Crustless Brown Sugar Pumpkin Pie won’t have you missing the crust, great served warm with ice cream! Hi all! I’m back after a short break. I spilled coffee on my laptop and killed it! It’s taken me over a week to get my files back and I took some time to learn a new video editing program. 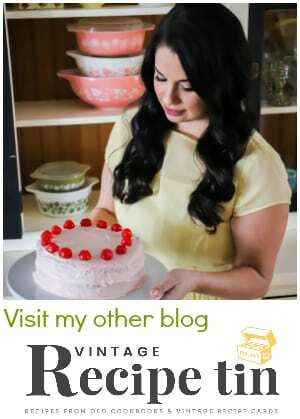 I’m happy to have this holiday recipe to share with you. If you have followed me for a while you will know I love pumpkin. 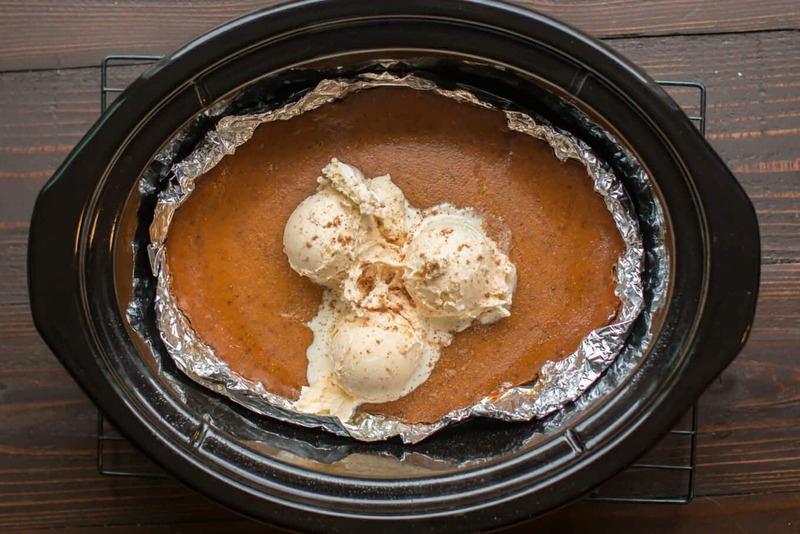 Pumpkin pie is by far my favorite way to eat pumpkin. Especially warm with ice cream. 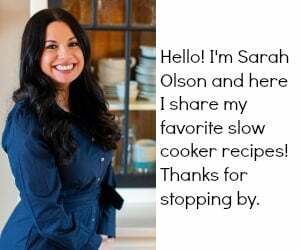 I use foil to line the slow cooker. This foil bowl I make will be what holds the pie and it is easily lifted out after the pie has cooled down a bit. Add a little ice cream and a sprinkle of nutmeg and dessert is served! Below is my YouTube video, this is my first attempt at using a new to me video editing program, let me know how you like it. I still have so much to learn, I’m just glad I figured out how to do the basic here. I was killing me not being able to get this out to you sooner. You can follow me on YouTube, here. 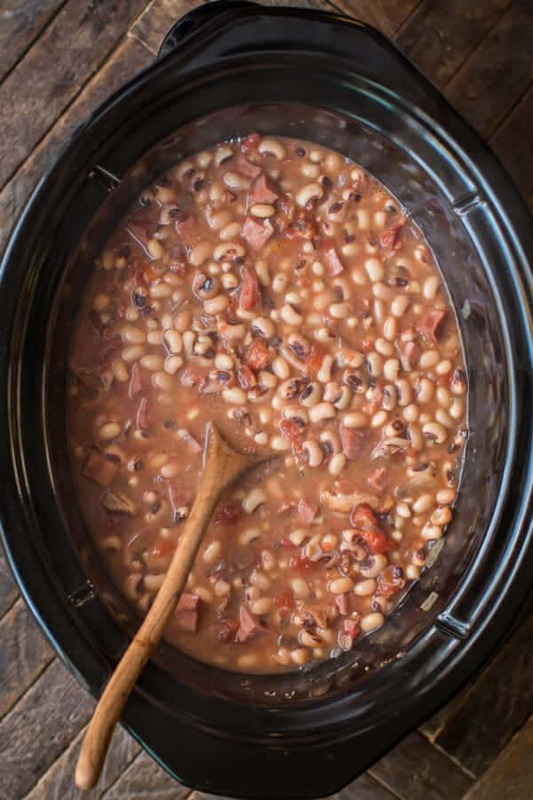 Line the slow cooker with foil. I use 2 pieces of heavy duty foil and make a bowl at the bottom of the slow cooker, layering each pieces on top of each other. 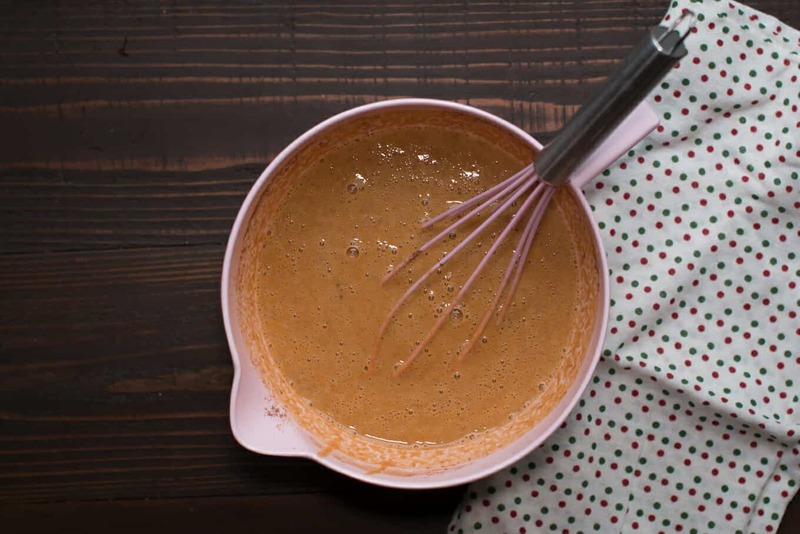 Mix together all the ingredients together in a medium sized bowl with a whisk until smooth. 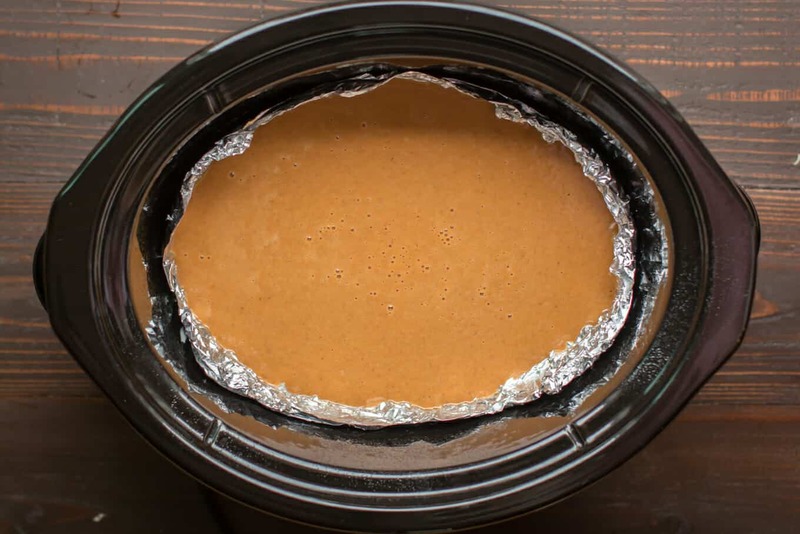 Spray the foil in the slow cooker with non-stick spray. Pour the pumpkin mixture into the foil. Cover and cook on HIGH for 2.5 hours or until the filling is set, keep the lid on the entire time. When the cooking time is done. Remove lid. Take the ceramic insert out of the base and place on a cooling rack for about 30 minutes. I like to serve this warm with ice cream. If you want to serve cold, place the insert in the fridge. Note- it is easier to get the foil with the pie in it out easier when the pie has cooled completely. Hi! 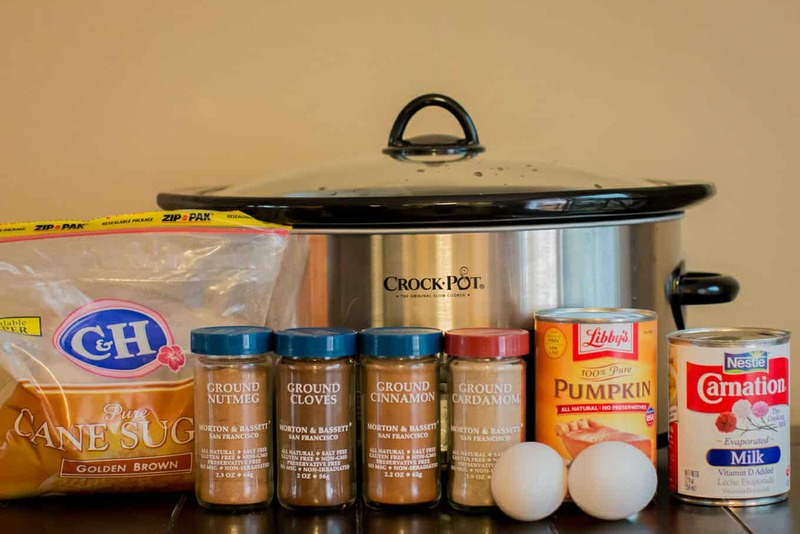 I am wondering if you could use a glass or metal pie pan inside the slow cooker to hold all this wonderful pumpkin. Thoughts?? Kimmee, I love your idea…do you use the 6 qt. 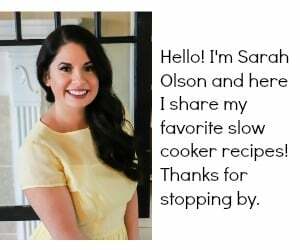 oblong slow cooker? 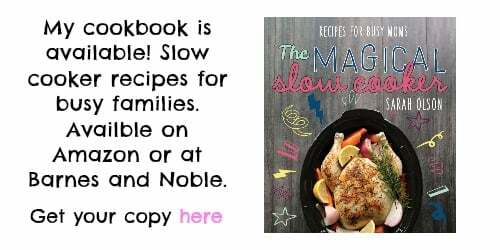 That’s what I use when I’m cooking up slow cooker recipes. Did you have to adjust the cooking time? Yum Yum Yum! Looks delicious!